Jerry Falwell has died. I will not revel in his death. Hearing that he keeled over after breakfast with a friend, I must ask whether he truly fell well. But that's just a bad pun. That's not reveling. It's nice, however, to have a well-known figure kick the bucket and not have to pretend I'm sad in any way. That being said, I will say that I sincerely, sincerely hope that some kind of heavenly clerical error sends Falwell to Gay Heaven. If such a place doesn't already exist outside of some bar in the Castro, I hope it now exists and Falwell is there, horrified and on the receiving end of cutting remark after cutting remark from the likes of Paul Lynde. In closing, I would like to submit one image for your perusal. 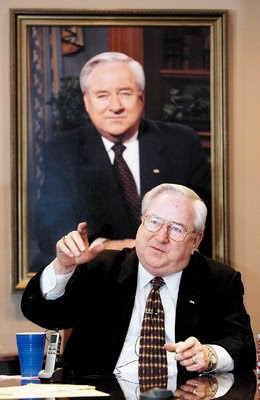 It's been said before, I'm sure, but I'm not sure whether the bigger sin being depicted is Falwell's pride — at displaying a painting of himself — or gluttony — at having gained so much weight between the time the painting was made and this photo taken.